A home remodeling project can be exciting, challenging, and depending n the scope of the project, a bit disruptive. At Degnan Design Build Remodel, we understand that choosing to improve your home is a big decision and we work closely with our clients to make the process run as smoothly as possible. 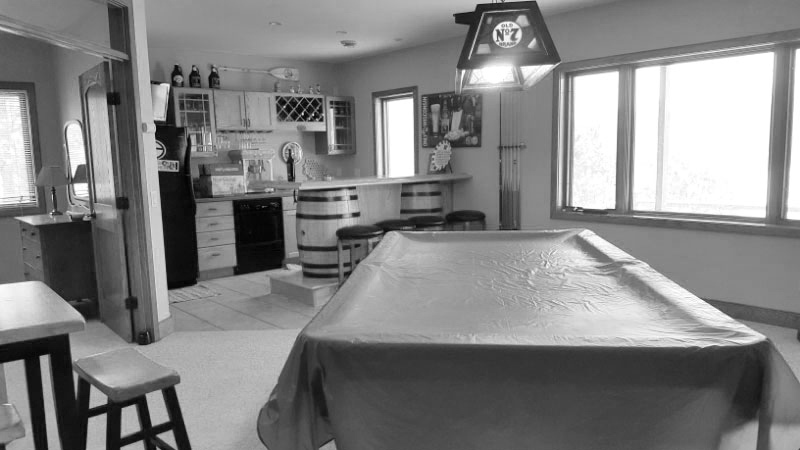 We recently completed a significant home remodel for clients in the Terrace Park Neighborhood in Windsor, WI. It was a challenging multi-room project. The homeowners wanted to update their master bathroom and kitchen, and redesign their finished basement to fit their lifestyle, and create a space their teenage kids could use and enjoy. Let's take a closer look at this project and how we worked closely with our clients to transform their home. Here is some background on our clients and the scope of their remodeling project. Our clients have known us for ten years; we first met back when they were considering remodeling, buying or building. We developed a friendly relationship. Our kids played sports together, and the guys played racquetball together. They eventually decided to buy an existing home and hired us to do the remodeling. They chose a home on a beautiful large lot in the Terrace Park neighborhood of Windsor, WI. It was designed by a home builder as his personal office. Though it was only built a dozen years ago, it seemed outdated by more than that. The materials, finishes, design, and style were formal, heavy and trendy— not at all timeless. Our clients were looking for several upgrades and solutions. The homeowners wanted to update and revamp several areas of their home, including the kitchen, master bathroom, and basement. • The master bathroom and kitchen were very impressive, “circa 2000” even though the house was built several years after that. • The basement was designed as a home office by the original owner of the property, a homebuilder. It didn't function the way the new family wanted and required both cosmetic and functional updates. • The home required a cosmetic update and balancing of the living area, revamping the master bathroom and closet space. 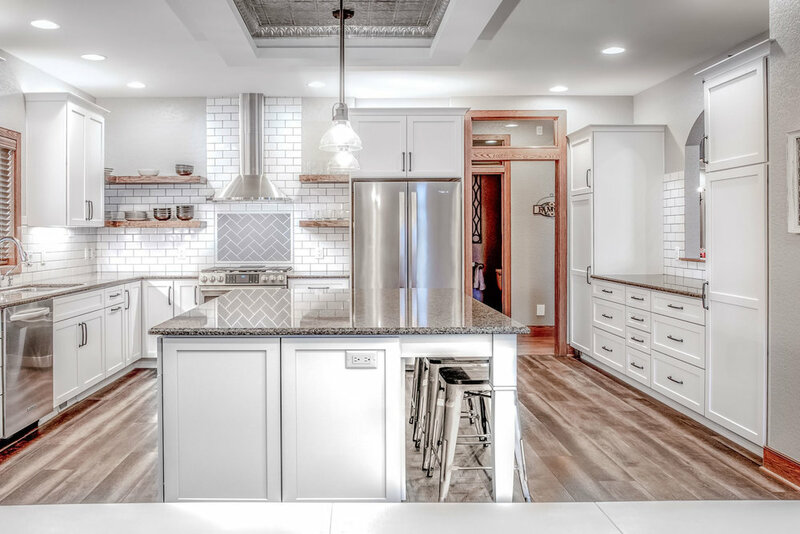 The clients gave us the task of updating the aesthetic of the kitchen, the look and functionality of the master bathroom, and creating a new, more functional layout for the basement to better meets the needs of the family. The project had a tight timeline: the goal of having the work substantially completed by Thanksgiving. Let's take a look at the transformation of each element of this multi-room remodel. Click to view photos of the completed project. The look of the kitchen required updating; The kitchen cabinetry used cheap hardware and partial overlay doors. The backsplash was a neutral dated beige, and the overall feeling of the kitchen was dark and tight. 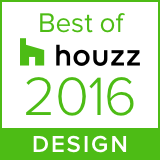 We worked with the homeowners to select more modern finishes. The goal in the kitchen was to update the aesthetic and functionality of the space. The functional updates to the kitchen include all new Dura Supreme maple cabinets with Hudson doors. The perimeter cabinets are finished in “Linen” with the island cabinets painted in “Zinc.” We added floating shelves made from reclaimed wood we sourced ourselves. To reduce waste and cost, we removed and reused kitchen cabinetry in other areas of the home and re-used the granite countertops whenever possible. To match the granite countertops, we designed the color scheme including, cabinets, backsplash, and flooring to work seamlessly. The former desk area was converted to a beverage center outfitted with Dura Supreme Cabinets with Hudson flat pattern doors providing an updated, yet timeless look. The center was painted in “zinc” to match the island an upgraded the with soft-close drawers and hinges. We used a 3CM Cambria Quartz countertop for the beverage center, in Torquay color with a beveled edge. To brighten the space we painted the walls Sherwin Williams essential gray. The backsplash features complimentary Daltile Rittenhouse Square tiles in white and suede grey to enhance the gray and white color scheme. The flooring was replaced with Coratec Plus HD in Vineyard Barrel Driftwood. The functional updates to the kitchen include new cabinets with modern storage accessories including soft close drawers, full overlay doors, and roll-out trays. Finally, we added an island to provide a central space for the family to gather for family dinners, and for the kids to do their homework. As you can see from the before pictures, the master bathroom had very dated, amenities. The unused stand alone jetted corner tub and separate shower were awkwardly placed and a mishmash of dated cheap finishes. The walk-in closet was too small to be functional for the couple. 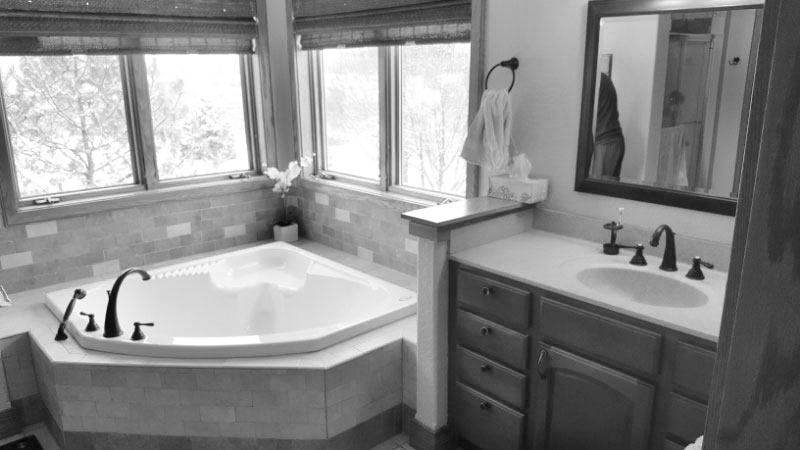 We were tasked by the homeowner to update the functionality and aesthetics of the master bath. We started with a gut of the space and then adjusted the layout to provide a more massive walk-in shower and walk-in closet. We moved the door opening and vanity to improve the flow of the space. The original bathroom had no door. This was inconvenient, so we installed a pocket door to provide privacy and maximize the available space in the bathroom. We transformed the master bathroom by slightly moving the shower to provide space for the new walk-in closet. We updated the look and feel of the space by replacing the dated black fixtures with polished chrome Pfister Park Avenue fixtures for the shower, sink, and new Mirabelle Hibiscus soaking tub. To save on the budget, we reused the existing cabinetry and painted it white. We painted the walls with Sherwin Williams essential gray to carry the color scheme from the kitchen area into the master bath. To modernize the tile work we chose Shaw Elegance mosaic for the floor, and Shaw Elegance 3X6 in taupe for the shower walls and vanity backsplash. 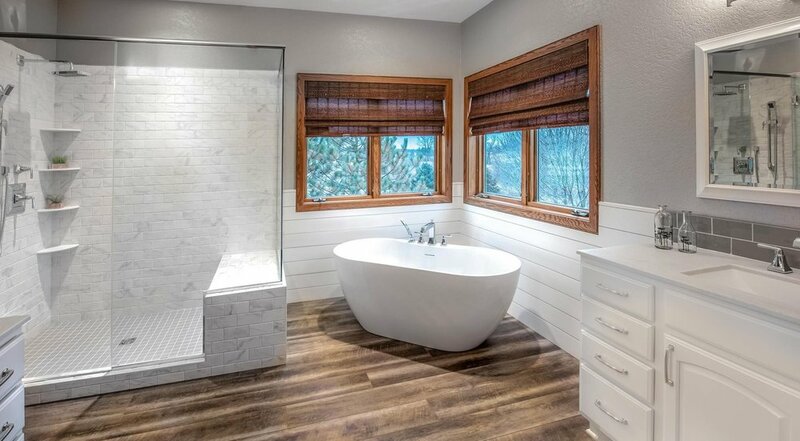 We also included a Wilsonart Corner shelf and a Schluter Kerdi shower system to create an elegant, relaxing shower experience for the homeowners. We replaced the floor with a durable easy to clean Fresco Driftwood LVP by Coretec. For the vanity top, we used cultured marble with an integral bowl by Classic Marble of Arthur which looks stunning with the new Pfister polished chrome fixtures. As a result, the master bathroom has an entirely new look and a new layout that includes improved flow, better functionality, and additional walk-in closet space. The lower level of the home was originally designed by the former owner (the home's builder) to function as an office for his construction business. As a result, the layout was awkward and didn't meet the needs of the new homeowners. We redesigned the space to include two bedrooms for family visits and a more functional common area for the entire family to enjoy. We combined two small conference rooms to create a larger playroom, and the sizeable former office space was converted into the two bedrooms the family requested. To give the space a more open feel, we installed Stainmaster Plank Series flooring in an Espresso color. We also brought the gray and white color palette into the space from the kitchen and bathroom. In the family room, we re-did the wet bar using recycled cabinets from the kitchen, painted white. Recycled cabinets not only reduced the budget, but this also helped achieve our goal for a “Greener” project. Reused cabinets mean less material going to the landfill. We redesigned the wet bar and included a Plomosa 23x18x8 stainless steel, single bowl undermount sink fitted with a Pfister pull-out sprayer. We then updated the bar and added extra storage using recycled base cabinets and wine storage racks below the peninsula. As a part of our Green initiative, we also chose to reuse an 8' tall glass door/transom in the lower level. We sourced and installed a 6” tall steel beam, (instead of a traditional wood header) to make it properly fit. We achieved several goals and met several key challenges with this transformational project, and the homeowners are delighted. We managed to remodel more than half of the home, both on the main and lower level while the clients were able to remain in the house using the living room, three bedrooms, and a bathroom. We're experts at allowing our clients to stay in the house during major projects by offering them another area of the house to retreat to, in this case, there were few unaffected areas remaining, but we still made it happen! In terms of updates, aesthetically we solved many appearance problems throughout the home be removing old finishes and replacing them with a more timeless design and higher quality materials. The kitchen was transformed into a modern space with all of the necessary amenities to make it more functional and improve the flow and functionality. We updated the finishes and added a more modern design and color palette. 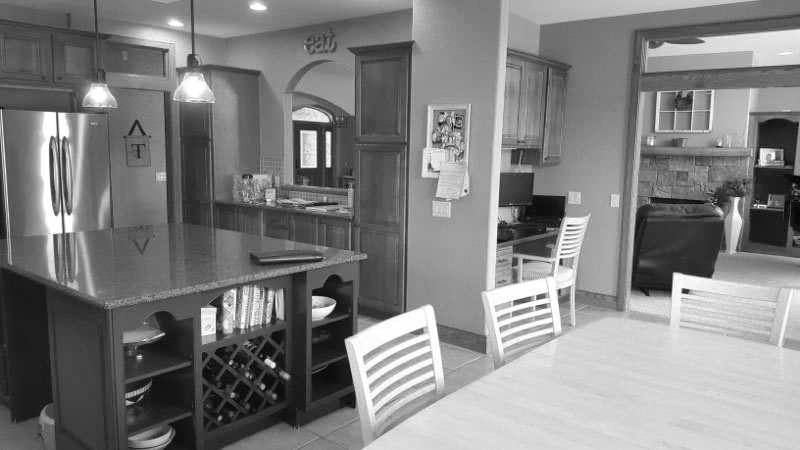 By re-using both granite countertops and repurposing cabinetry, we cut down on waste and managed our clients budget to allow for what was truly important to them. Upstairs, the master bathroom was utterly transformed from a dated space, into an elegant, luxurious oasis for the homeowners. By slightly moving the shower we created an additional 15 square feet of closet space. The newly open shower shows off the modern looking tile work keeping the bathroom feeling large, even with the additional closet space. Adding the pocket door allows for maximum use of the interior space as there is no door swing, and closing the space with the pocket door offers privacy if one member of the couple wants to sleep in. Everything they need to get ready for work, including the walk-in closet is available behind a closed door. The finishes are elegant, transforming the feel of the home from stuffy and formal to open, beautiful and serene. The lower level is no longer a warren of individual rooms with to passageways. It's been transformed into an open, organized and inviting space. We created a hallway to organize two rooms into spare bedrooms that both feature proper lighting and egress. Two other rooms have been opened up to create a new large game room. And, while the original game room was separated from the family room by a single door, we opened it up and used the recycled 8' double glass door and transom to create an open, inviting and airy space the entire family, and their guests can enjoy.